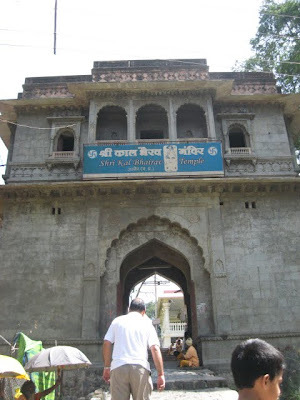 One of the most famous temples in Ujjain, this temple adds to the similarity of Ujjain and Kashi. 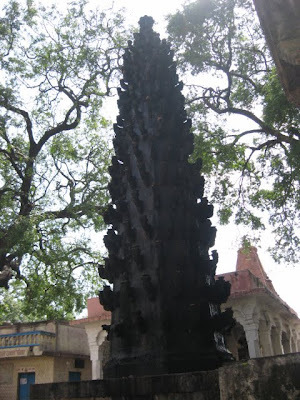 As at Kashi, Kal Bhairav is the Kshetrapal, or the guardian deity of the city, and it is the custom to leave the keys with the deity when the temple is closed at night, in the belief that he takes care of the temple and its properties. However, this temple is famous, not for its origins or its importance in the scheme of temples, but for its deity who guzzles wine by the gallons. Yes, the main offering to the deity is wine, and this is also the only Prasad given to the devotees. People flock to this temple, all carrying bottles of wine as an offering. Liquor is available 365 days a year outside the temple. Our driver had an interesting tale to tell regarding this custom. According to him (let me make it very clear to anyone wishing to argue about the veracity of this tale, that this is completely his version of the story!!!! ), when Indira Gandhi was the PM, some doubts were raised about the use of the wine which was offered to the deity. There were some who believed that the liquor offered to the deity was later sold by the pujaris. The priests took offence at such an allegation and wrote to the PM, offering to submit to further investigation if they were assured of availability of wine all through the year, if they were proven innocent. Apparently, or so the tale goes, the offer was accepted and investigations carried out over a period of almost a year, but nothing was ever proved against the priests, and they had their demand met. Today, no matter whether it is a festival or a dry day, liquor is available all through the year at the temple, but only as an offering. An interesting story, wouldn’t you say? The temple is built inside what looks like a fortress, and the present temple is said to have been built by the Marathas. There are supposed to be some good paintings in the Malwa style inside, but they are barely visible, and in any case, no one at the temple seems inclined to draw attention towards them. All eyes are on the deity, into whose mouth liquor is poured! 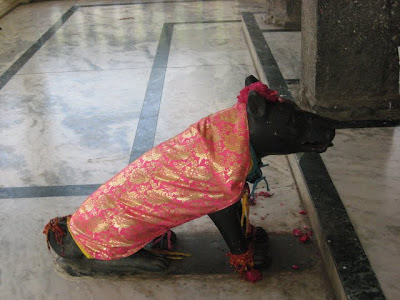 The vehicle of Kal Bhairav is a dog, and the life-like statue of the one outside the sanctum is accompanied by many of its companions of flesh and blood. 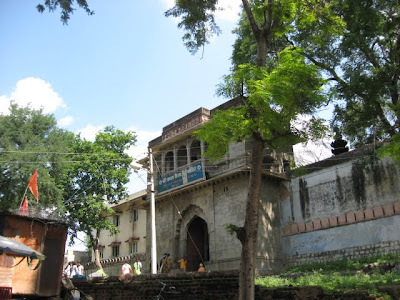 It is said that as at Kashi, there are 8 temples to the various Bhairavs (collectively known as Ashta Bhairavs) near this one. 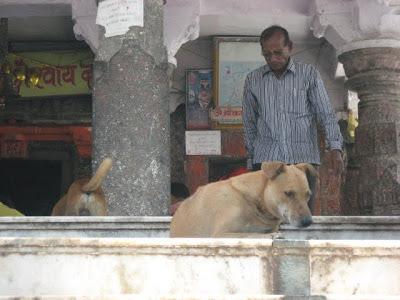 In fact, I even read of an underground temple to Patal Bhairav within the same compound. However, not much seems to be known about these temples, and in any case, there are few who want to visit such out of the way temples, and we were unable to collect any more information. If you happen to know more details, please do let me know. Offering wine to the deity that's is unheard of in these part of India. here in Bairavar temples we offer only kollu , til and light only milagu lamps. 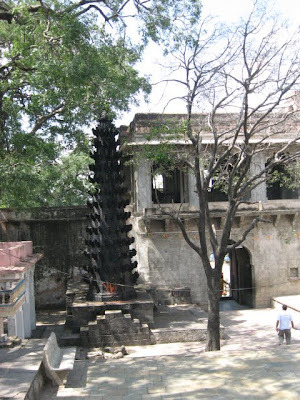 It is very much true that there exists a "Patal Bhairavi " temple under the Kaal Bhairav temple. I have even learnt that the "ash/basham" used in Mahakaal Bhasham Aarti used to be collected from cremation ground near Kaal Bhairav temple. 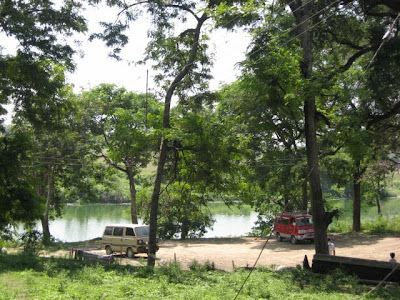 Nearby this temple , there is a very old temple in the forest where King Vikramaditya gained "Baital Sidhhi". Not many people visit this temple. 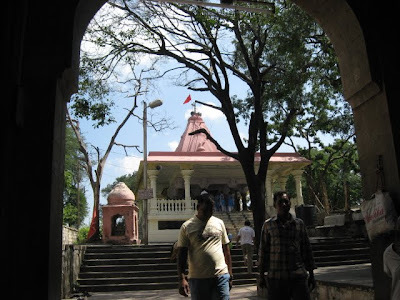 I have visited the Patal Bhairavi temple, it is on the left side of the main kaal bhairav temple. there is a very small window like enterance which leads to this dark cave like temple, there is a small Shivling in the temple. About other temples in Ujjain, a must visit is the temple of Mangalnath. This temple is on the way towards the Kaal Bhairav Temple. 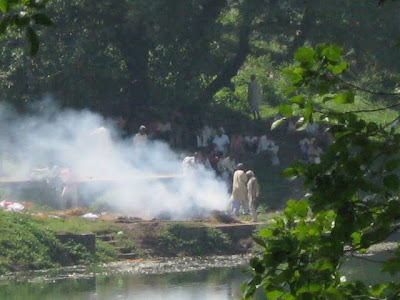 om hreem bam batukaye aapad uddhaahrnaye kuru kuru batukaye hreem om , jai baba bhairav, jai baba batuk bhairav jai baba kaal bhairav. I just came back from kaalbhairav temple in ujjain.i am from Goa and had doubt about God drinking wine but when i saw what was happening there with my eyes..it was clear to my mind that God exits and kaal bhairav God is the aswer.it was his birthday when i reached there and there was a big Que standing for offering n i have to rush back as i had to catch my bus in 20 minutes..belive me i could got to him directly without wasting a minute. offered and got his blessed coconut as prasad to take home..its a miracal..jai kaalbhairav.. 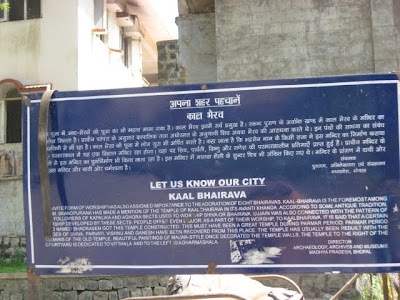 I visited ujjain first time on 18 th march and had been to kaal bairav too.i was anxious to know about kaal bairav. thanks to anu ji for good photos and some details. special thanks to acharya raghav kirti ji for more details to know about the creation of kaal bairav by devon ke dev Mahadev.I have read two stories of creation of bairav by Mahadev to punish lord brahma.At visit I was offered a photo of mahakal and kaal bairav both in one by pujari ji and feel luchy to have that . kaka guru I have placed that photo in my mandir. can I? can you post more details about? thanks again.